During the ceremony where she was honored for outstanding public service, Jessica Martinez-Brooks thanked her elders for the example they had set for her. OCCC’s Community Outreach and Education Department director spoke with teary eyes after receiving an award June 30 at the college’s FACE Center. “I have been surrounded with strong women my entire life,” Martinez-Brooks said. Community Outreach and Education Director Jessica Martinez-Brooks, left, poses with UNA-OKC President Priya Desai, and then-OCCC President Paul Sechrist. Martinez-Brooks was given a UNA public service award June 30 for outstanding public service. She thanked her mother-in-law Patricia Brooks, retired Spanish professor, for showing her what grace, compassion and hard work look like in the classroom. She also spoke of her late grandmother, Anita Martinez, for being a strong influence not only in the Hispanic community, but also on Martinez-Brooks herself. Anita Martinez was director of La Puerta De Oro Senior Citizen Center for 30 years, and was honored by the Oklahoma Human Rights Commission. Martinez-Brooks earned the 2015 Public Service Award from the United Nations Association of Greater Oklahoma City, as well as a Legislative Citation, for her life-changing work throughout the community. The award was presented by then-OCCC President Paul Sechrist, and UNA-OKC board members. Martinez-Brooks is immersed in the local community through technology centers, nonprofit organizations, and local businesses, to provide free adult education. Priya Desai, UNA-OKC president, spoke of the work Martinez-Brooks does. “She has helped over 3,000 people annually across Oklahoma to overcome language barriers,” Desai said. OCCC President Paul Sechrist spoke highly of Martinez-Brooks’ accomplishments. “It truly is beautiful to see her fulfill her personal mission of making sure people are economically sound, can speak English, and find a home here in America,” he said. 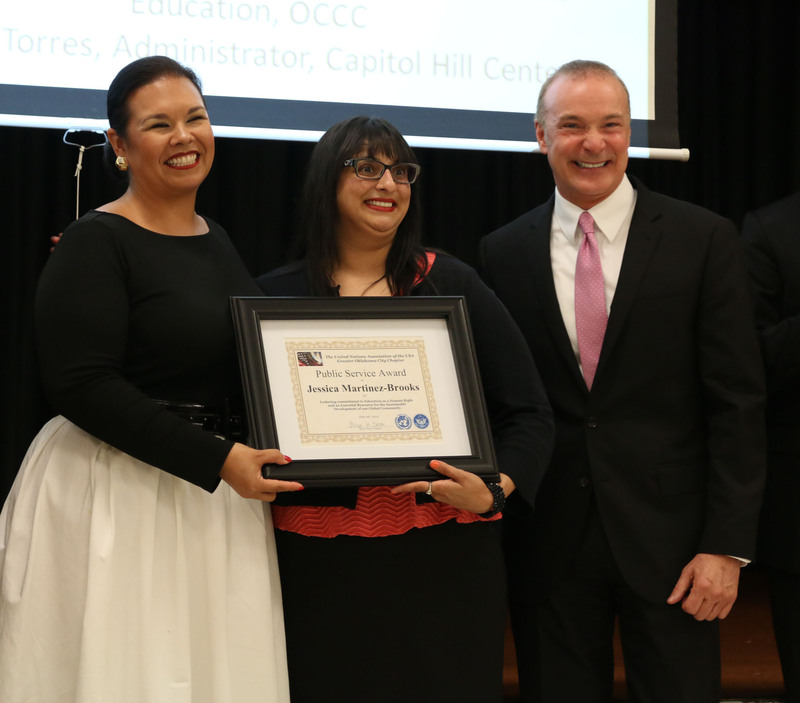 Oklahoma City School Board member Gloria Torres and Assistant Director of Adult Education Deborah Copeland presented Brooks with the Legislation Citation. “Wherever you go with Jessica, people are stopping her to thank her,” Copeland said. For more about the UNA-OKC, call 405-585-3310. For information about the Public Service Award, visit www.una-okc.org/public_service.html.